When Melina Olmo, SIS/BA ’99, was a student at American University, personal financial circumstances prompted her to develop some unusual study habits. A transfer student from Puerto Rico, Olmo arrived at AU in 1996 to discover that her grants and loans could only go so far toward covering her expenses. One key area of difficulty: affording textbooks. Upon learning that certain library books could only be checked out overnight, she followed a nocturnal schedule of checking out books at 11:45 p.m., studying from midnight to 4:00 a.m., and returning the books to the library in time to avoid incurring a fee. Naps during the day helped her catch up on sleep, but the schedule still took a toll. Stories like Olmo’s inspired the Latino Alumni Alliance to develop a book award—$500 annually to help students in AU’s Latinx community offset the cost of textbooks. Now the LAA hopes to accomplish a new milestone for the award: getting it endowed so it can have a lasting impact for generations to come. 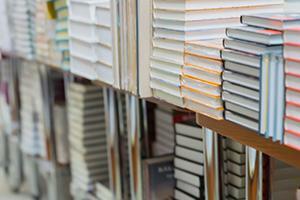 AU students aren’t alone in finding the costs of textbooks difficult to handle. A study featured in Inside Higher Ed earlier this year found that 46 percent of current and former college students surveyed reported that textbooks and course materials had “a big impact” on their financial situations. Many said they had given up meals or trips home to afford books, and LAA board members recalled similar situations in their own lives. The alliance gave out its first award in 2014. Every year since, LAA has selected one student each semester who can demonstrate how they have given back to the community through leadership, advocacy, or academic accomplishments. She recalled times that she and friends would look at the required textbooks before registering for classes. If a course was particularly textbook-heavy, they would consider choosing a different one instead. For the most recent recipient, Silvana Scott, CAS/BA ’18, the award meant she could study in a way that best suited her needs. The history and literature major noted that textbooks might be cheaper online, but she finds it easier to study and learn by reading physical copies of books rather than virtual. “Books stay with you forever—a lot of the books I got this semester I know for a fact will help me in my future endeavors,” Scott explains. The LAA award inspired the Black Alumni Alliance to start its own book award. When the BAA was able to get its award endowed, meaning it can be given out in perpetuity, the LAA established its own goal to do the same by the end of this fiscal year. Garcia, who is now a legislative analyst at the Department of Homeland Security, sees endowing the award as an opportunity for the Latinx community to bond.